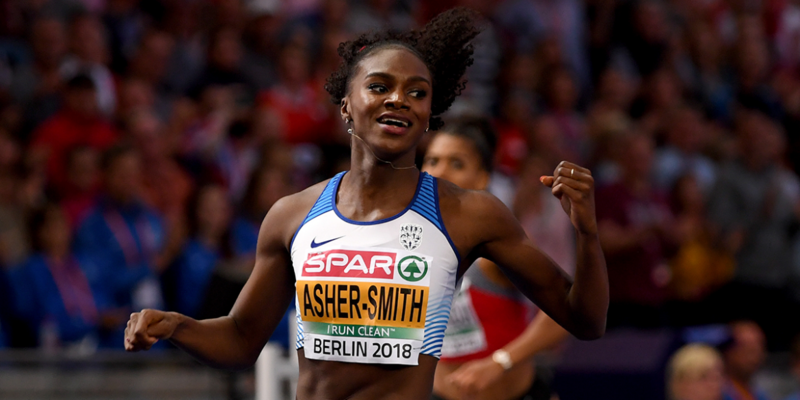 It was a case of deja-vu as evening six of the European Championships in Berlin saw Dina Asher-Smith (coach: John Blackie; club: Blackheath & Bromley) claim 200m gold in a stunning British record time to complete a historic sprint double on a night which also saw Shara Proctor (Rana Reider; Birchfield Harriers) and both 4x400m relay teams win medals. Behind the medal placings, and both racing in their first major finals in British vests, Bianca Williams (Lloyd Cowan; Enfield & Haringey) and Beth Dobbin (Leon Baptiste; Edinburgh) placed in sixth and seventh respectively, Williams running 22.88 to Dobbin’s 22.93. Opening up with a strong 6.58m (-1.0) to take some of the early initiative and be confident of receiving three further attempts past round three, Proctor improved to 6.69m (-0.3) in round four to move into silver, with compatriot Jazmin Sawyers (Lance Brauman; City of Stoke) also going well as 6.66m in round five bumped her up into bronze just three centimetres behind her teammate. The current world leader, Lorraine Ugen (Shawn Jackson; Thames Valley) suffered disappointment as an off day saw her fail to make the top eight after three jumps to leave her exiting the competition. Kicking off for the British team from lane three, the Rabah Yousif (Carol Williams; Newham & Essex Beagles) saw the team get off to the start they would have wanted, with Dwayne Cowan (Cowan; Hercules Wimbledon) dropping a rapid opening 200m on his leg before being pulled back in slightly by France, Poland and Italy, with ground to be made up on the final two legs. When the baton reached the newly crowned European 400m champion Matt Hudson-Smith (Brauman; Birchfield Harriers), the 22-year-old showed exactly why he is the best on show in Berlin as he passed four of his competitors by on the back straight to propel Britain into bronze with Martyn Rooney (Graham Hedman; Croydon) waiting to take the baton on anchor. Rounding off the evening’s action, the British female quartet of Zoey Clark (Eddie McKenna; Thames Valley, Anyika Onuora (Reider, Liverpool Harriers), Amy Allcock (Glyn Hawkes; Aldershot, Farnham & District) and Eilidh Doyle (Brian Doyle, Pitreavie) went about maintaining the women’s fine record in the event too, with Clark setting them on their way with a solid opening leg. A world medallist in the 4x400m herself last summer, and on the back from two consecutive personal bests earlier this week which saw her enter the final of the women’s 400m as the fastest qualifier, Laviai Nielsen (Christine Bowmaker; Enfield & Haringey) went in search of a maiden senior medal on the international stage. The final of the men’s 5000m saw British trio of Marc Scott (Jerry Schumacher; Richmond & Zetland), Chris Thompson (Alan Storey; Aldershot Farnham & District) and Ben Connor (Steve Vernon; Derby) put themselves to test. Fresh from a block of altitude training in St Moritz, Scott’s gutsy crack at the podium fell narrowly short as a time of 13:23.14 saw him place in fifth. Scott moved through from tenth at the 3500m mark to pick off competitors and claim a great finishing placing of fifth. In field action, and throwing in her second consecutive European final following safe progression from her qualifying pool earlier in the week, Jade Lally’s (Zane Duquemin; Shaftesbury Barnet) trio of throws left her marginally down on the top eight of the field and out of the competition at the half-way stage. Opening with 55.73m, Lally’s best came in round two and 57.33m, with the mark just shy of 70cm down of leaving her in the top eight. The final day of action tomorrow sees British action in the women’s marathon at 09:05am before the closing session of action at the stadium tomorrow evening. The full timetable for the championships, including results, can be found here.